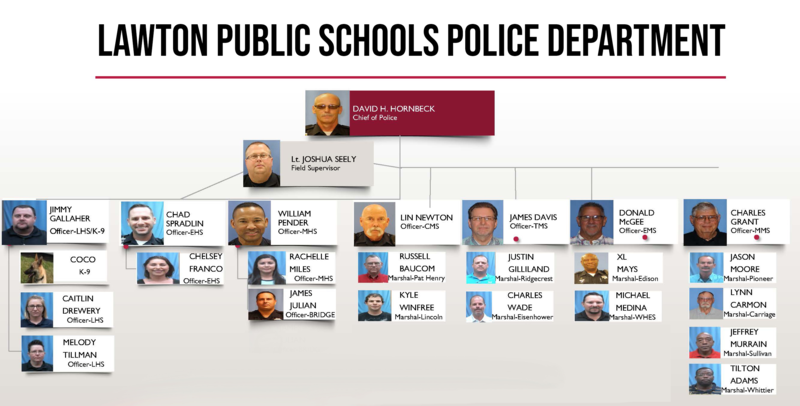 The Lawton Public Schools Police Department provides full police services to all LPS students and employees twelve months a year. In addition to police services, the Council on Law Enforcement Education and Training (CLEET) accredited police department provides physical security for LPS property and event security for after hours functions. The LPS police officers participate in continuing education by attending CLEET training at the state level, and also train with local law enforcement agencies on a regular basis. Together with a great team of administrators, teachers, and students, our district has become one of the safest school districts in the country. For additional information, contact Chief of Police David Hornbeck at dhornbeck@lawtonps.org or call 580-357-6900.